The title of the Investors Realty Quarterly Office Report over the last four years seems to involve the re-use of words like stable, consistent and steady. These words tend to be very comforting and fairly typical of Omaha. While 2015 did not break any records, and we remain cautious due to some instability in the general economy, we feel the reference to a robust market is a fair statement. In 2015, Omaha’s commercial real estate brokers leased nearly 1,000,000 sq. ft. and absorbed more than 340,000 sq. ft., both of which exceeded the three previous years’ results and followed a very solid 2014 performance. We tracked 147 transactions for 980,368 sq. ft. (1,000 sq. ft. and larger) in 2015. That is 12 more transactions than the previous year and 30 more than 2013. More good news is there were 11 large transactions (20,000 sq. ft. and up), which is as many large deals as we did in 2013 and 2014 combined. In fact, the market saw more transactions year over year in every square footage size category except one, where we fell from 14 to four transactions in the 10,000 – 20,000 sq. ft. category, which is significant. Vacancy rates overall are up nominally, with half of the submarkets seeing slightly lower rates and half of the submarkets seeing higher rates. Construction costs are increasing, which impacts virtually every project, but to account for that it seems lease terms continue to stretch longer and contract rents seem to be higher. Brokers report being busy and are cautiously optimistic. Broker optimism is due to exciting new projects such as the Capitol District and HDR’s announcement of its new downtown headquarters as well as planned activity in Aksarben Village and on the West Dodge corridor. Caution is due to ConAgra’s decision to move its headquarters to Chicago as well as rising interest rates and disruption in the energy industry. The disruption has impacted local energy businesses and businesses with a major interest in the energy sector, most notably Union Pacific Railroad. If history is any guide, Omaha will be opportunistic, making the best of these difficulties. Already, ConAgra’s decision has created opportunity for other Omaha companies and real estate professionals. Treehouse Foods, the buyer of ConAgra’s private label food business, Ralcorp, will become a player in the Omaha area, leasing space and hiring. Further, the lower energy prices are keeping prices for services in check and encouraging other spending. The increase in interest rates will both encourage buyers and sellers to close sooner than later and provide much sought after inflationary pressure, rewarding those who have saved and invested. 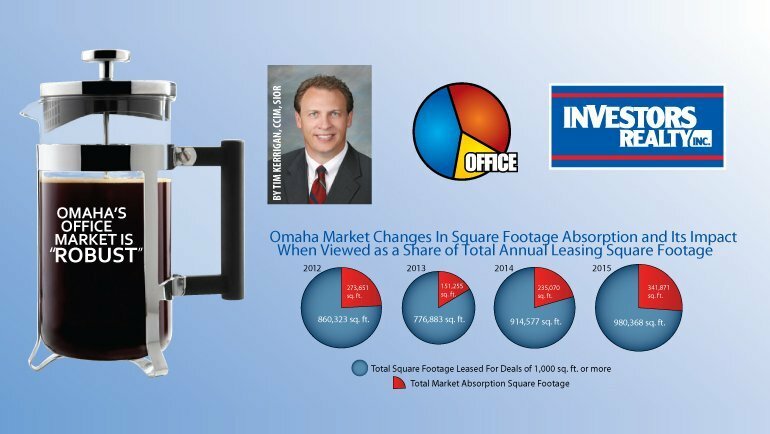 Investors Realty continued to play a big part in the Omaha office market in 2015. Our firm was involved in over half of the 30 most notable transactions of the year we identified. As we enter 2016, our office brokers are working on dozens of office projects including a handful of very large assignments that will impact the market dramatically in the coming years.